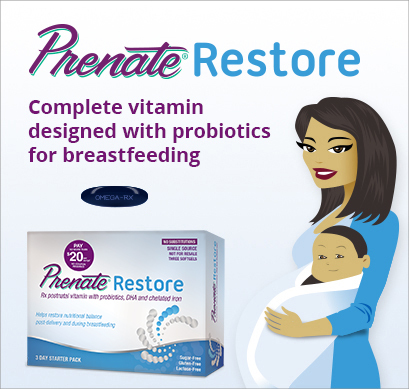 †Prenate® Restore contains L-methylfolate calcium. The L-methylfolate ([6S]-N5-methyltetrahydrofolic acid calcium salt) in Prenate® Restore is less than 1.0% D-isomer. REFERENCES: 1. Prenate® Enhance prescribing information, Avion Pharmaceuticals,LLC, 2013. 2. Prenate® Restore prescribing information, Avion Pharmaceuticals, LLC, 2013. 3. Prenate Mini® prescribing information, Avion Pharmaceuticals, LLC, 2013. 4. Prenate® DHA prescribing information, Avion Pharmaceuticals, LLC, 2012. 5. Prenate® Essential prescribing information, Avion Pharmaceuticals, LLC, 2012. 6. Prenate® AM prescribing information, Avion Pharmaceuticals, LLC, 2013. 7. Prenate Chewable® prescribing information, Avion Pharmaceuticals, LLC, 2013. 8. Prenate® Elite prescribing information, Avion Pharmaceuticals, LLC, 2012. 9. Nexa® Plus prescribing information, Upsher-Smith Laboratories, Inc., 2012. 10. CitraNatal Harmony® prescribing information, Mission Pharmacal Company, 2012. 11. Vitafol®-Ultra prescribing information, Everett Labs, 2013. 12. PreferaOB ONE® prescribing information, Alaven Pharmaceutical, 2012. 13. OB Complete™ Petite prescribing information, Vertical Pharmaceuticals, Inc., 2012. 14. Huurre A, Laitinen K, Rautava S, Korkeamaki M, Isolauri E. Impact of maternal atopy and probiotic supplementation during pregnancy on infant sensitization: A double-blind placebo-controlled study. Clin Exp Allergy. 2008; 38:1342–1348. 15. Michail S, Sylvester F, Fuchs G, Issenman R. Clinical practice guideline. Clinical efficacy of probiotics: Review of the evidence with focus on children. J Ped Gastroenterol Nutr. 2006; 43(4):550-557. 16. American College of Obstetricians and Gynecologists. Committee Opinion Number 495. Vitamin D: Screening and supplementation during pregnancy. July 2011. 17. Dietary Supplement Fact Sheet: Vitamin D. Office of Dietary Supplements, NIH Web site. http://ods.od.nih.gov/factsheets/VitaminD-HealthProfessional/. Reviewed June 24, 2011. Accessed September 24, 2013 18. Simopoulos AP, Leaf A, Salem N Jr. Workshop on the essentiality of and recommended dietary intakes for omega-6 and omega-3 fatty acids. J Am Coll Nutr. 1999; 18(5):487-489. 19. Hanzlik RP, Fowler SC, Fisher DH. Relative bioavailability of calcium from calcium formate, calcium citrate, and calcium carbonate. J Pharmacol Exp Ther. 2005; 313(3):1217-1222. 20. Kamdi SP, Palkar PJ. Efficacy and safety of ferrous asparto glycinate in the management of iron deficiency anaemia in pregnant women. J Obstet Gynaecol. 2014; Early Online: 1–5. Available at: 10.3109/01443615.2014.930098. Accessed December 29, 2014. 21. Pineda O, Ashmead HD, Perez JM, Lemus CP. Effectiveness of iron amino acid chelate on the treatment of iron deficiency anemia in adolescents. J App Nutr. 1994; 46(1,2):2-13. 22. Picciano M, McGuire MK. Use of dietary supplements by pregnant and lactating women in North America. J Clin Nutr. 2009; 89(suppl):663–667. 23. Picciano MF. Pregnancy and lactation: Physiological adjustments, nutritional requirements and the role of dietary supplements. J Nutr. 2003; 133(6)(suppl):1997-2002. 24. Huurre A, Laitinen K, Rautava S, Korkeamaki M, Isolauri E. Impact of maternal atopy and probiotic supplementation during pregnancy on infant sensitization: A double-blind placebo-controlled study. Clin Exp Allergy. 2008; 38:1342–1348. 25. Michail S, Sylvester F, Fuchs G, Issenman R. Clinical practice guideline. Clinical efficacy of probiotics: Review of the evidence with focus on children. J Ped Gastroenterol Nutr. 2006; 43(4):550-557. FormiCal® is a registered trademark Nephro-Tech 1, LLC, covered by one or more claims of U.S. Patent No. 6,528,542.